Submissions: General articles should be sent to editor Brian Pankuch at the above address. We would appreciate both 1) printed copy (hardcopy) and 2) a readable file on a 3 1/2 inch Macintosh or mM compatible diskette. We have fewer problems with 3 1/2 inch diskettes. We can read the files from Microsoft Word or Works,Aldus PageMaker 3.01, 4.0, for other word processors please send text or ASCII code files if possible. Hardcopy is fine if that is most convenient..
Submission deadlines: Fall issue- Sept. 25; Spring issue - March 25. ALL NEW AND RENEWAL SUBSCRIPIIONS : PLEASE SEND REMITTANCE TO M. Lvnn James, Department of Chemistry, University of Northern Colorado, Greeley, CO 80639. RATES; USA 1 year $2.50, two years $4.50: Other countries 1 yr $5, two yr $9. 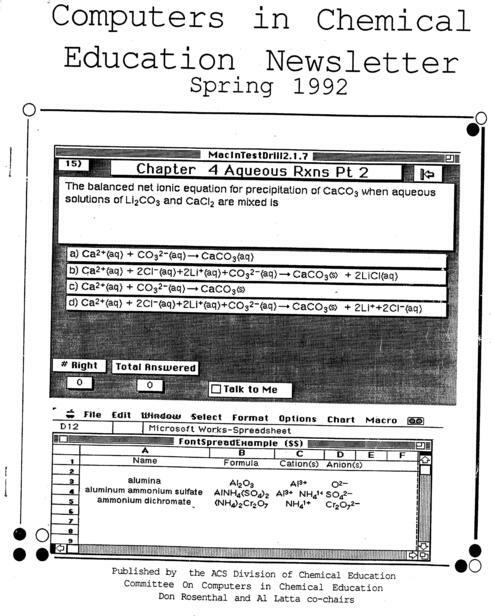 Please make a check or money order payable in US funds to Computers in Chemical Education Newsletter. Consulting Editor Donald Rosenthal, Department of Chemistry, Clarkson University, Potsdam, NY 13676. Send meeting notices, etc., to Don. The ACS Division of Chemical Education's Committee on Computers in Chemical Education (C.C.C.E.) seeks to promote and publicize the use of computers and computing in chemical education. We do this via this Newsletter, and by organizing and participating in symposia and workshops at regional and national meetings. This Newsletter serves as a vehicle of communication with those interested in computing. Articles and information are provided for our readers. Ideally, readers communicate with each other by writing articles or short paragraphs describing their use of computers in chemical education. The QUERIES sections provide an opportunity for readers to ask and answer questions. The success of this Newsletter depends upon your willingness to participate in these activities. Chemistry Into the Curriculum" for the Biennial Meeting at Davis in August 1992. Don Rosenthal and Ken 'Ratzlaff (University of Kansas) are organizing symposium sessions for the 1994 Biennial Meeting at Bucknell University. Over a dozen C.C.C.E. National Computer Workshops have been held. Workshops are planned for the University of Kansas in August 1993 and at Bucknell University after the Biennial Meeting in August 1994. C.C.C.E. activities are designed to meet the needs of chemical educators. You can help in identifying these needs. An open meeting of the Committee is planned for the Biennial Meetings in Davis. You are invited to attend. We welcome your suggestions and participation. If you have suggestions or wish to volunteer to assist us, a form at the back of this Newsletter should be filled out and returned. AI Lata of the C.C.C.E.